This study focused on events in a representative, 50-pond Indonesian shrimp farming system in Pangkep district, South Sulawesi. Ponds were stocked with Penaeus monodon and the study extended across a single cropping period between May and October 2010. It was designed to improve our understanding of the main causal pathways for white spot disease (WSD), the most serious cause of production loss in these systems. The longitudinal observational study focused on recording the occurrence of different genotypes of the causal infectious agent, white spot syndrome virus (WSSV), in selected components of the system across time, and looking for relationships with pond outcomes, particularly WSD occurrence. 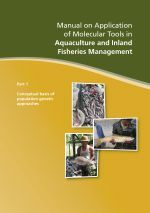 We expected that findings would (a) enable relevant Indonesian agencies, and ultimately farmers themselves, to better identify localities suitable for smallholder shrimp farming using better management practice (BMP) programs and (b) inform modification and simplification of these programs, thereby improving both profitability and adoption rates. 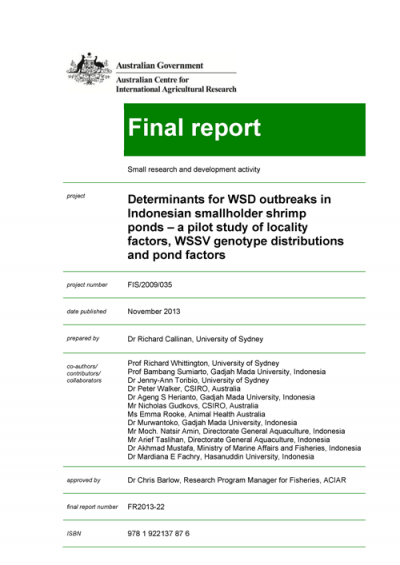 To identify, using locality-specific environmental data, pond environmental data and data on WSSV genotype distribution and dynamics, the likely determinants for WSD outbreaks at a suitable, broadly representative locality in South Sulawesi. Our transmission trials showed that genotype variations did not occur during three sequential passages (four including the preparation of the stock inoculums) in L. vannamei or alternatively in other crustacean hosts. This indicates the genotypes are likely to be sufficiently stable for use in local epidemiological studies during disease outbreaks in shrimp ponds. WSSV was ubiquitous at the site. Strategies to prevent WSD outbreaks are probably more useful than trying to prevent WSSV infection in endemic areas. Stocking with WSSV PCR test-negative postlarvae (PLs) supports maintenance of an outbreak-free pond for at least the first two months of production. Once PLs have been excluded as a risk factor for WSSV infection, biosecurity (minimising risk of heavy WSSV exposure post stocking) and environmental factors (management of risk factors for WSD outbreaks) become more important. Crabs, wild shrimp, zooplankton and/or polychaetes were not important sources of WSSV infection for WSD outbreaks in farmed shrimp. These findings suggest that stocking PCR test-negative PLs, coupled with careful management of water intake during nearby WSD outbreaks are the two most useful practice changes farmers can adopt to reduce the risk of outbreaks in their ponds. Establishment of an active, well-resourced and trained extension service, committed to fostering cohesive, informed farmer groups, is the key to enabling these inexpensive practice changes.